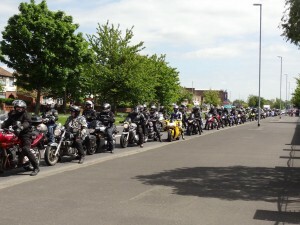 Saturday the 23rd of May was our annual demo ride. 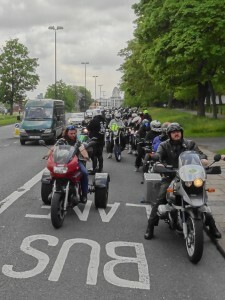 This year we had two main aims: to highlight our ongoing campaign for bikes to be allowed in bus lanes, and to protest about West Yorkshire Combined Authority’s omission of motorbikes in their 20 year transport policy consultation. 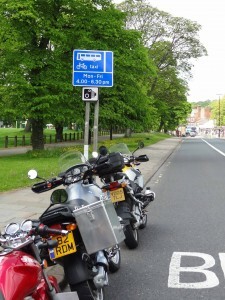 We also wanted to let the people of Leeds know that we exist and that riding bikes can be fun and an alternative means of transport instead of cars or buses. Before the event we got in touch with local press to let them know what we were up to. 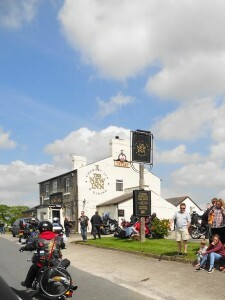 There’s an article in the Yorkshire Evening Post, and another on the BBC website. Our media officer did an interview for Radio Leeds (at 1:07:00 and 2:07:00 for as long as it’s available at http://www.bbc.co.uk/programmes/p02r97m6). Radio Leeds also interviewed James Lewis, chair of the WYCA Transport Committee, immediately after the 2:07 interview and he promised to hold workshops with us in June and July. Let’s make sure he doesn’t forget… We also made the top story on Look North. 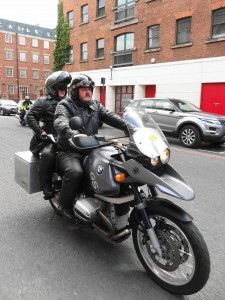 As for the ride itself, everyone will have their own experiences and stories. What follows is your webmaster’s experiences of the day. 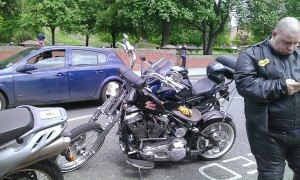 This was the second Leeds MAG demo ride that I’ve done. 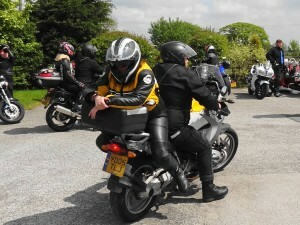 Last year I was still on a little Chinese learner bike and took place in torrential rain so turning up at Squires on a 600 cc Yamaha Diversion in warm sunshine was quite a contrast. 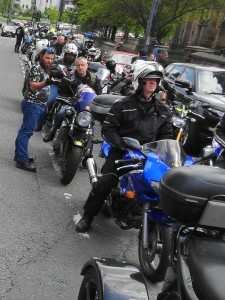 I was pretty close to the front but it was clear that there were a lot of bikes, probably around 200 or so. 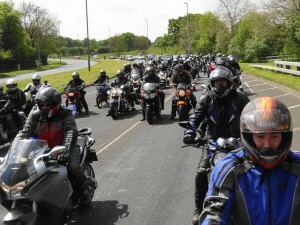 We set off at 12.00 and headed off towards Leeds. At Crossgates we pulled over to let people catch up and it took 10 minutes or so for everyone to get there. Meanwhile there were loads of people beeping car horns, waving and taking photos. With that many bikes it became clear just how badly phased some of the traffic lights are. Some of the worst were at the junction of Swinegate, Mill Hill and Bishopsgate Street. 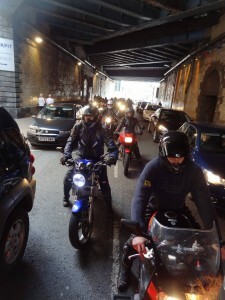 200 bikes waiting at a red light in the tunnel under Leeds railway station can make a lot of noise. 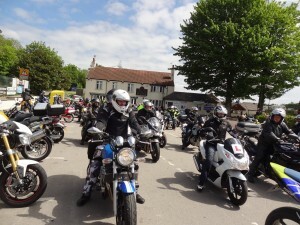 What follows is a selection of videos taken during the ride. 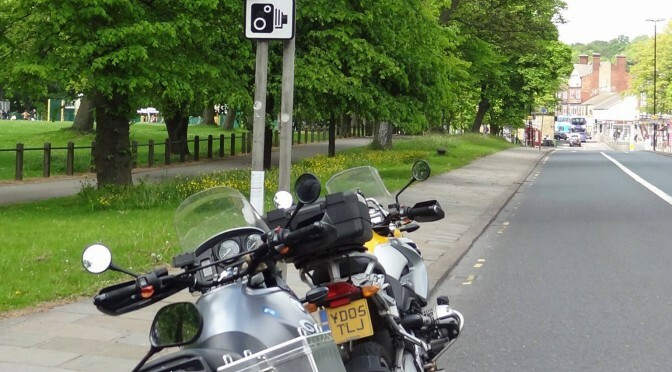 Apologies for any swearing: our camera operator was facing backwards on the back of a large BMW and a couple of sudden stops and starts may have taken her by surprise.